Every office, factory, home and school should have an accessible first-aid box. 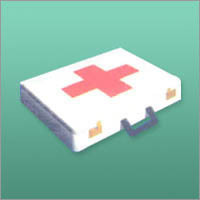 We offer a complete range of first aid kits to meet any requirement. Our comprehensive range of First Aid kits are designed for any situation. These come in a range of sizes. The kits include various essentials to deal with minor injuries and first response treatment to the major problems. Boxes are available in Tin, Aluminium, Plastic, Stainless Steel, Sags, & brief cases.